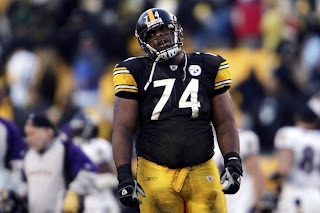 Not only will OT Willie Colon have season-ending Achilles surgery on Wednesday, but the Steelers also announced that rookie OT Chris Scott, the team's fifth-round draft choice, will also have surgery tomorrow to repair a foot injury he suffered while working out at the University of Tennessee. It is unknown how long Scott will be out of commission, but it doesn't sound great. To recap the offseason, that's two players (Sweed, Colon) out for the season, one (Roethlisberger) suspended for 4-6 games, another one (Holmes) who misbehaved his way out of town, and a rookie who got hurt working out. Whoever is working that Steeler voodoo doll is doing one heck of a job. As far as replacements for Colon go, Ed Bouchette feels that newly-acquired Jonathan Scott, who was signed in the offseason from Buffalo, will take Colon's place in the lineup. Scott started eight games for the Bills last season and will be reunited with incoming line coach Sean Kugler, who coached Scott in Buffalo. Bouchette also names Trai Essex, Ramon Foster, and Kraig Urbik as potential replacements for Colon. Gerry Dulac wrote the P-G article. ESPN says Flozell Adams is in town to get looked over by the Steelers.